Thanks to my friend, Green Girl Conservationist Homemaker, hereafter known as GGCH. I learned to upload a snap to my post. Now for those of you who do this on a daily basis, this is No Big Deal. However, for those of us who are computer illiterates, trust me, this is a Biggie. 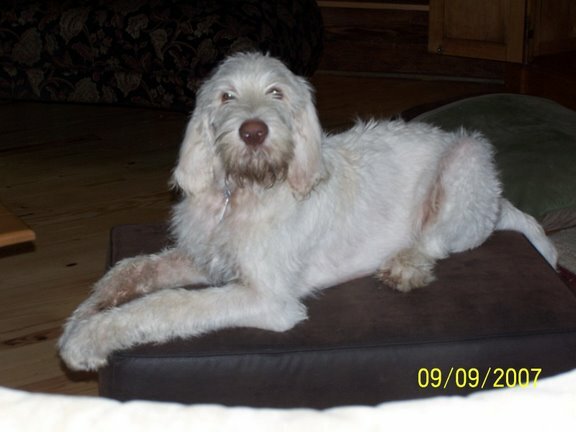 The pup in question is our Italian Spinone, Radar, now 11 mos and a delight with his Muppet looks and winsome ways. (See Westminster blog). At 99.6 lbs and counting, we are doing training as lugging him around or wrestling him to the ground is not in the cards, esp. for Auntie M at 5′ 2″ on a good day. Things are going very well: Come, Sit, Stay, all the usual. Has been housebroken for yonks. Sleeps well, and keeps us laughing with his silly grin. Radar’s only negative is a human-created one–our only neighbor across our marsh bridge on one side who ties her dog up and doesn’t want ours to visit. For dog owners everywhere, you know most of them are friendly and like to play with each other. Our rescue mutt, Murray, is aging and with arthritic hips, just doens’t fit the bill for an active pup like Radar. Judas, however, a 2 yr old athletic lab the neighbors own, does. The resultant rescues have not gone down well with the neighbors, so we installed a gate with side wings to keep Radar from ‘visiting’ his friend. Sad, really. Back to the drawing board. We may extend the fencing down our drive. So silly, isn’t it?